Feeding butterflies is easy! Attract butterflies to your backyard with this special nectar that can be used in standard butterfly feeders or sprayed directly on your flowers. 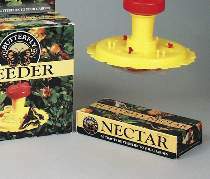 Includes nectar recipe instructions, plus butterfly feeding tips. Nectar was $4.99, now $2.49!